National Star students in Hereford opened their first pop-up shop in the community. When the management team at the Old Market Shopping Centre offered National Star at Hereford the opportunity to use the facilities free of charge, we jumped at the chance. From 12 to 18 February 13 students from National Star at Hereford took turns to manage the shop, providing them with the opportunity to put their numeracy and communication skills into action. For weeks leading up to the event the students were busy making a range of goods to sell, including upcycled furniture, handmade felt brooches, willow and wool wall hangings and clay hearts. 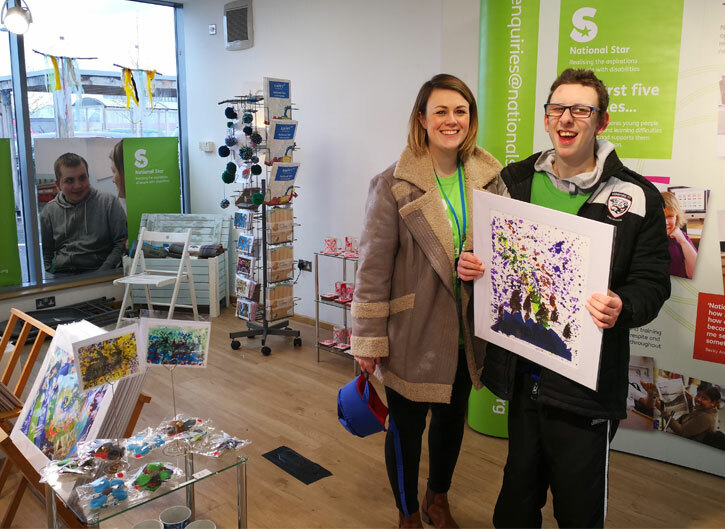 They also sold cards and artwork made by National Star’s social enterprise company StarPrint. ‘It was a wonderful opportunity for Hereford to meet the students and get to know about the work National Star is doing in the area,’ said John Mann, Head of National Star Wales and West. The pop-up shop was positively received by both the local community and the Old Market Shopping Centre. There are plans to launch another pop-up shop in Hereford later in 2018.